INDIANAPOLIS (CNS) — This year’s National Catholic Youth Conference was a new experience for Andrew Hawes, one he said may have changed his life. “I’ve witnessed the most amazing thing in my life — 24,000 kids kneeling and staring at the Eucharist,” the 15-year-old from the Archdiocese of Louisville, Kentucky, said Nov. 20. 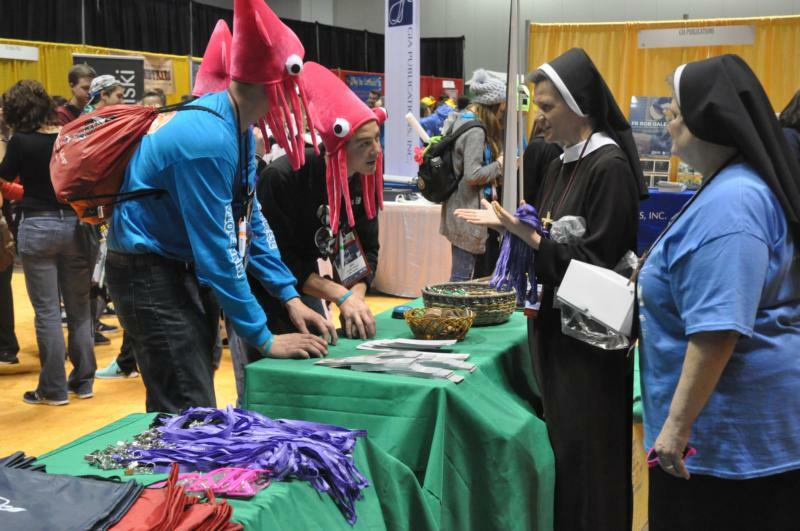 Teens from 55 parishes in the Archdiocese of Louisville joined the thousands of Catholic young people from across the nation at the biennial conference, held in Indianapolis at the Indiana Convention Center and Lucas Oil Stadium. The main events took place Nov. 19-21; an evening orientation for delegation leaders was held Nov. 18. The delegation from the Archdiocese of Louisville included 470 people, 380 of them teens. The remainder were parents, youth ministers and clergy. Some in the Archdiocese of Louisville’s delegation were returning to the conference for a second time, but the majority were new to the experience, which included workshops, eucharistic adoration, daily Mass and other activities. Hawes, from St. Edward Church in Louisville, said he was a little reluctant to share his faith prior to the conference. Brigid Stakelum said she was returning to NCYC for a second time, seeking to re-live the experience she had the first time. The 16-year-old member of St. Bernadette Church, also in Louisville, said she’d not been to confession in a while. She returned to the sacrament during the conference. Shaquan Hays, a 15-year-old who attends St. Monica Church in Bardstown, Kentucky, said: “I’ve found that spark I’ve been looking for.” He believes it was all “God’s doing” — from finding out about the national conference while attending another youth event earlier in the year to walking into the right workshop the night before. “I’m stronger in my faith now. I feel I can be the Catholic I was meant to be,” he said. For Alain Kagoba, an 18-year-old native of Kigali, Rwanda, the conference has helped him find his faith as he settles into life in Kentucky. He said his first experience at the conference two years ago was so “uplifiting” that he did everything he could to return a second time. “It’s a beautiful thing to see 20,000 other people who believe as I do,” Kagoba told The Record. His family moved to the United States nine years ago. When they lived in Kigali, the family always attended Mass, but for the first couple years in the U.S., he said, they didn’t. The family, he explained, was settling into their new life — they lived in two other states before settling in Kentucky — and they didn’t speak English. Now a member of Blessed Teresa of Calcutta Church in Fairdale, Kentucky, Kagoba said being introduced to mission trips and NCYC has helped to ground him in his new life. This second experience has encouraged him to express his faith, he said. On the last day of the conference, parents and youth ministers took part in a workshop called “They’ve Been to the Mountain Top. Now What?” The workshop was led by Carole Goodwin, director of youth and young adult ministry for the Archdiocese of Louisville, and Archbishop Joseph E. Kurtz of Louisville. It was designed to encourage parents and youth ministers to help teens keep enthusiasm for their faith after the conference.